'Mona, a name given to the house by our daughter when she could not say 'Sonoma,' is a four bedroom/four bath home. 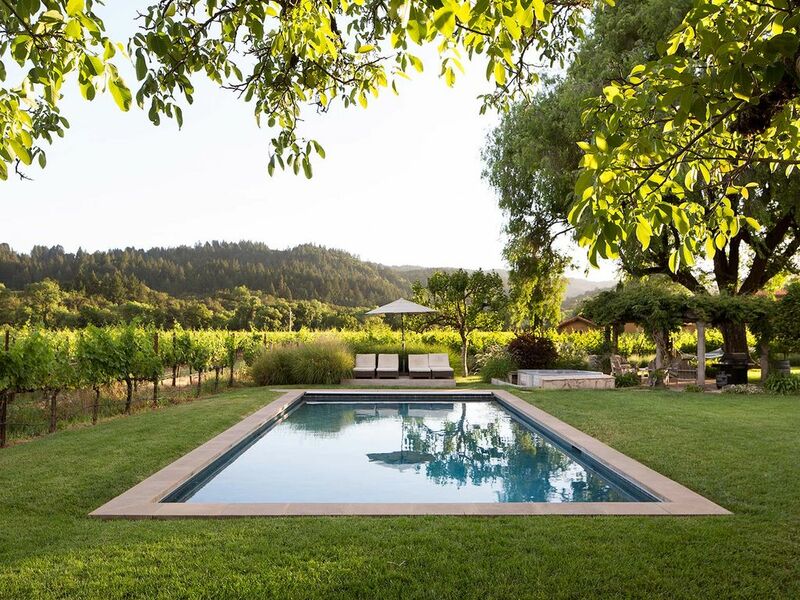 The property includes a one bedroom/one bath guest house and is in the heart of Dry Creek Valley in Healdsburg, California. Our vacation home sits on one acre nestled among the vines of Dry Creek Valley including its own vineyard on the property. It is surrounded on all sides by acres of vines, lavender and mountains. Please visit out new website (see below) for the complete information. The house has a beautiful front porch running the span of the house. Four rocking chairs sit year round on the porch so you can enjoy the sunsets. The back yard has a covered patio, grill, outdoor furniture and new hot tub. As well, there is an in ground, solar heated pool. The pool has 2 shallow ends and stairs that run the width of the pool for in pool seating and has a locking automatic safety cover. A newly built covered porch sits at the end of the pool and has 4 lounge chairs and 3 end tables. There are two more lounge chairs below the walnut tree on the other side of the pool. French doors line the front of the house from the kitchen to the living room to the master bedroom. There are three full baths in the main house - one for each bedroom. The master bedroom has a queen sized bed and gas fireplace, the second bedroom has a queen, 2 built in bunks and a trundle and the third bedroom has a very comfortable pull out couch (no bar in the middle!). All beds have high end linens. The separate guest house is a large one bedroom with its own bathroom. There are French doors that open onto its own porch shaded by a walnut tree. Note: Guest house is rented with main house only, not rented separately. The main living room overlooks the front yard, apple tree and vineyards. There is a fireplace, flat screen TV, directtv and DVD. There is a second TV with Directv in the third bedroom/sitting room. The house has WIFI as well. The kitchen was remodeled with state of the art appliances; including a 6 burner stove. There are ample plates, glasses, serving dishes and kitchen tools for your cooking needs. The table sits 8 but has a leaf to expand to 10-12. The kitchen also overlooks the vineyards and the french doors lead to the porch where there is an outdoor table and seating for 8-10 over looking the vines and sunsets. The property is surrounded by acres of Dry Creek vines, lavender, roses, and even apple trees, peach trees, and walnut trees. Just a short walk down the private country road is Dry Creek. It is truly a magical place. We are a family of 5 that lives in San Francisco. We have homes in Healdsburg, CA and on Nantucket as well that we enjoy and rent via VRBO. We have been renting our home for over 15 years and have much experience doing so. We want our renters to feel at home when they rent from us and create the same special memories that we do when we spend time on the properties. The sunsets are magical and the pool spa like. Being in the vineyards makes you feel like you are miles away. We have created wonderful family memories here and hope you will too. There are two fire places. The living room has a wood burning fireplace and the MBR has a gas fireplace. There is a wood shed on the property with wood. Wireless internet available throughout house. Small room off of kitchen to set up an office if needed. There is one in the office space but it is not usable. Wood burning fireplace, large sliding doors to front porch with views of vines, flat screen tv, sonos, couch and 2 chairs. Very comfortable. Ottomans for additional seating. Yes, many provide. We leave it up to guests to either replenish or let us know when something is used completely. Seating for 8 people but 2 additional leaves available for more seating. We have fit upwards of 12 people. Additional chairs may be needed so please advise. DirectTV and TIVO and DVD. Xbox at house. PLease bring own controllers and games. Large lawn in front and back of home. Front deck spans length of house w/ 4 rocking chairs to watch sunsets. Back deck off guest house w/ 6 more rocking chairs. Shaded deck w/ 4 lounge chairs at end of pool and covered gazeebo. Solar heated pool with stadium style seating at one end. We stayed at Mona for a laid back bachelorette weekend. The location was amazing- we walked to the country store just down the road for coffee and breakfast each morning, and the town of Healdsburg is a short drive, where we had some great meals. It was a beautiful home with lovely grounds, and the owners were always responsive. We are so happy that you enjoyed your weekend with your girlfriends and took advantage to of the close proximity to the Dry Creek General Store and Healdsburg square restaurants! Thank you! We are so glad that you enjoyed the property and your stay at 'Mona. We hope to have you again in the future! Beautiful home in a gorgeous setting. We thoroughly enjoyed our weekend with friends in this beautiful home. Would definitely recommend renting this home! We are so glad that you and your guests enjoyed your time at 'Mona this weekend! We hope to have you back again in the future. Fabulous stay in wine country! The house is so well stocked and beautifully decorated! We were so comfortable in the space and felt grateful for quick communication when we had questions. Easy check in and check out!! The home and property were lovely! The home and guest home were very well furnished and very comfortable. Unfortunately, it had been raining heavily before we got there and the weather was cool so we didn't get to enjoy the outdoors very much. We had dinner in a couple evenings and the kitchen was well stocked. We drank wine, laughed and had a wonderful time overall! I highly recommend this property! What a beautiful spot! We loved Mona from the moment we pulled into the driveway. The charming rocking chairs, the beautiful yard/pool....just as pics describe. The only bummer was it rained the entire time we were there but that did not put a damper on our stay b/c the house was entirely lovely. There was plenty of space for all nine of us. The rooms were darling - recently newly furnished with fresh/modern palettes. The kitchen was well stocked so we could make breakfast/snacks for all of us easily. The team that helped us could not have been more helpful in terms of the house and also the "in" spots near us. Walking to the General Store was a favorite morning routine - even with umbrellas. We cannot wait to return and hopefully the sun will be out so we can take a dip in the lovely pool. How nice; we are so glad that you enjoyed your stay! We hope to have you return to 'Mona in the future (and have the opportunity to use the pool)! • Rates are subject to change. One night rentals available occasionally. • TOT Cert # 472N • Cancellations less then 60 days before rental will be returned only if home can be re-rented for same rate. If home is rented for lower rate then only fee for new rental rate will be returned. • No parties,weddings or large gatherings allowed without prior consent of owners.